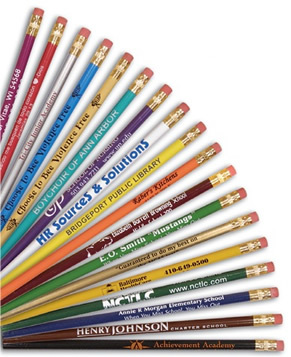 Pencils with your Company or Organization customized information are a long lasting and positive way to advertise. 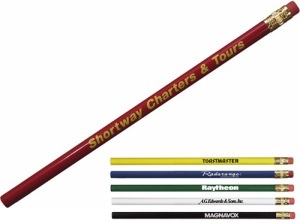 We also offer church and golf pencils, with or without custom imprinting. Give us a call (706-374-0710) for a FREE quote and to put our years of promotional and advertising experience to work for you. *These products are Tariff Targets and prices may change. Contact us for current pricing. Promotional Pencils A $20 non-refundable artwork charge for round wooden pencils must be paid before work can begin. Mechanical, Carpenter and Golf Pencils have a $35 non-refundable artwork charge. For logos and other artwork, add an additional $25. 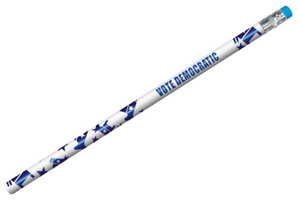 We specialize in pencils for church, business, conservative, or political campaigns. Your personal advertising message is imprinted on the side. 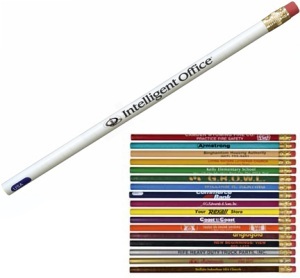 The personalized pencil is an inexpensive way to do promotional advertising. Please note: Pencils (except Church or Golf pencils) do not ship sharpened. Please contact us for additional charge for pencil sharpening. Seven inches long. Imprint area is 3/4" x4". Number 2 lead. Available pencil colors are red, bright yellow, white, black, dark green or dark blue. This is a high quality thrifty pencil for low cost. Seven inches long. Imprint area is 3/4" x4". Number 2 lead. Available pencil colors are red, bright yellow, dark blue, dark green, white or black. Inexpensive Refurbished Pencils are seven inches long. Custom imprint area is 3/4" x 4". Number 2 lead. These are seconds that have been repainted and retipped. The available colors are yellow, red, orange, dark blue, dark green, black. 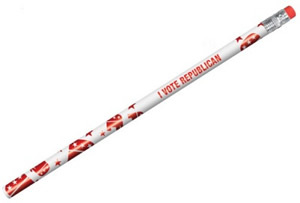 An inexpensive personalized pencil for church or political gifts. The Heat of your hand changes the color of the pencil. Popular advertising item. Available colors are orange to bright yellow, dark blue to light blue, violet to bright pink, red to bright orange, bright green to bright yellow. Black imprint is recommended. For more Mood Pencil products, click here. A one-color silk-screened custom imprint, up to 5 lines of copy. Imprint area for your personalized message is 3/4" x4-1/2". Number 2 lead. The available colors are white, teal, cream, yellow, bright yellow, red, maroon, orange, light blue, dark blue, purple, violet, light green, dark green, black, metallic silver, metallic gold, and brown. Quality #2 wood pencil with silver ferrule with red elephants and stars foil wrapped on a white pencil. Red, blue or black imprint is recommended. Quality #2 wood pencil with silver ferrule with blue donkeys and stars foil wrapped on a white pencil. Red, blue or black imprint is recommended. Priced so low that you'll save big! Painted and assembled in the USA. All paint conforms to US standards for lead content. Only available in quantities of 5000 or more at these low prices. Pencils are available in these colors: white, cream, yellow, bright yellow, light green, orange, red, teal, violet, light blue, dark blue, dark green, brown, purple, maroon, metallic silver, metallic gold and black. Frosty Grip Mechanical Pencil has removable cap with white eraser. Uses 5 mm lead. 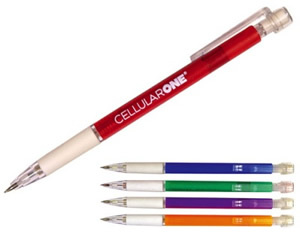 Mechanical pencil has frosted color barrels available in red, blue, green, purple or orange. Soft, Medium and Hard Leads available. Imprinted on 1-side. Contact us for 2-sided imprints or for Red Lead. Hexagon Golf or Church Pencil Imprint colors available are white, black, light blue, dark blue, brown, red, orange, yellow, light green, dark green, maroon, teal, gold or silver. Imprint area is 1/8" x 1-1/2" per line, up to 3 lines. 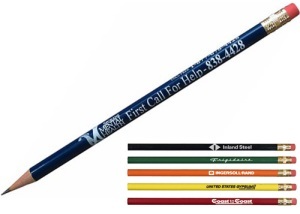 These Church and Golf pencils are also available without imprinted text. Give us a call at 706-374-0710 for pricing. Mood Pencils - Pencils that change color with the heat of your hand. 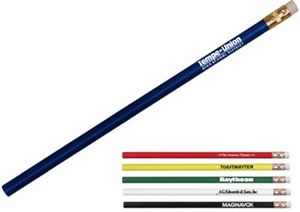 Personalized Pencils - Imprint your name on selected patriotic and other colorful preprinted designs. 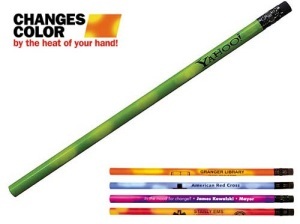 Promotional Pencils - So fun, so bright...so right for school, home, or office! Our colorful pencils make great gifts, especially when personalized. The popular myth that NASA spent millions of dollars on developing a pen that would write in outer space, while the Russian Cosmonauts simply used pencils is not true, but it comes to an interesting assumption, that pencils are indispensable. Cheap pencils have been around since the dawn of time and although we have since had many breakthroughs in the pencil world (mainly mechanical pencils) we still turn to our age old friend, the cheap pencil. 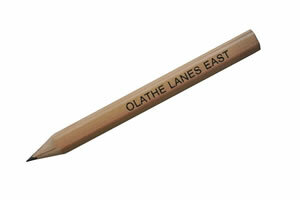 Custom personalized pencils are wonderful advertising tools because everyone needs one. They're small and very inexpensive and any business could benefit from using them to advertise their business name or logo. They are a common tradeshow, seminar or convention handout and for good reason. They have proven to stand the test of time and they will never grow old! Modern promotional pencils are the descendants of ancient writing instruments. In ancient Rome, scribes wrote on papyrus (an early form of paper) with a thin metal rod called a stylus, which left a light but readable mark. Other early styluses were made of lead. Today we still call the core of a pencil the "lead" even though it is made from nontoxic graphite. Graphite came into widespread use following the discovery of a large graphite deposit in Borrowdale, England in 1564. Graphite left a darker mark than lead, but was so soft and brittle that it required a holder. At first, sticks of graphite were wrapped in string. Later, the graphite was inserted into wooden sticks that had been hollowed-out by hand! The wood-cased pencil was born.